Summer is almost here, so treat yourself! Summer vacation. It’s so soon, or maybe it’s already here for some of you lucky ducks. For me, summer is synonymous with good food, great friends, and fun, bright fashion. Normally, my look relies heavily on layers and pieces like statement outerwear or ripped jeans. So during the summer months, when it’s often too hot to rock such things, my style is a bit different from the rest of the year. When you can’t finish a cute sundress or tee-and-shorts look with a cool jacket, where do you turn? Ah, yes. Accessories. I hope you have fun with your style 365 days a year, but summer in particular is a time to embrace bright colors, bold trends, and quirky motifs. These ten accessory picks will help you do just that, while still leaving you with enough cash to spend on all your fun summer activities. Products: 1. Phone case – Charlotte Russe, 2. Flamingo pin – Lord & Taylor, 3. Sunglasses – Nordstrom, 4. Hat – Kohl’s, 5. Earrings – Charlotte Russe. 1. Why not let your phone get a fun summer makeover? 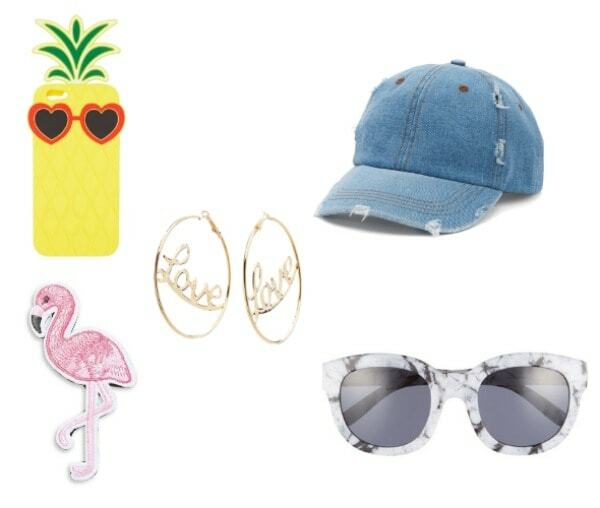 At just $10, it’s hard to say no to this cute pineapple who is clearly living her best life in heart-shaped shades worthy of Katy Perry. Come September, go ahead and switch back to your tried-and-true glitter case. But for now, snag this quirky case and prepare for a summer’s worth of compliments. 2. The patches and pins trend is still huge, and these personal accessories are such a fun way to customize everything from vests to shorts to hats to jean jackets. 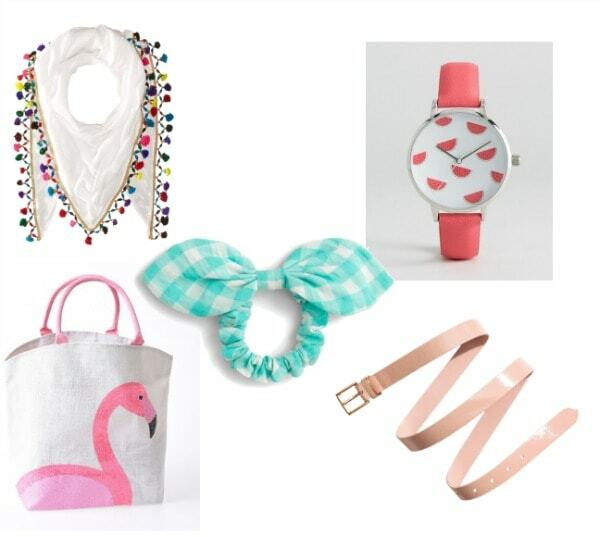 This cute flamingo will add a fun touch to everything in your wardrobe. My favorite part is that it looks like a patch but is really a pin — perfect for people like me who are too lazy to iron on appliques. Plus, unlike a patch, you can move it from piece to piece. Oh, and believe it or not, this feathered friend is under $5. 3. I’ve been seeing marble-effect sunglasses everywhere lately, and they’re not only cool, but versatile. These pretty, neutral ones will go with every summer outfit while adding a trendy touch of texture. 4. This denim baseball cap is so effortlessly cool. It would look equally fab with your hair down as it would with a pony, and as great with a girly summer dress as it would with something edgier. It’s the perfect signature accessory for summer. Bonus points if you decorate it with that flamingo pin. 5. I’m not sure why big earrings scream “summer” to me. Maybe it’s because they’re fabulous with tees and shorts but also flawless with a bathing suit, or because they look great with a baseball cap (hello, #4). Swap out your go-to gold hoops for this pair that (literally) makes a statement. Rock ’em everywhere and spread the love. Product info: 6. Scarf – Amazon, 7. Tote – Unique Vintage, 8. Belt – H&M, 9. Watch – ASOS, 10. Hair tie – J.Crew. 6. When there’s a little nip in the air or when you’re headed to a place that’s known for blasting the AC, a little scarf can finish a summer look nicely. I love this Betsey Johnson one’s beachy vibe and trendy pom poms. When it’s too hot to rock it around your neck, tie it around the handles of your tote for an adorably personalized touch. 7. Is it clear from this post how much I love flamingos? I’m totally lusting after this oversize tote, which, with its sequined motif and thick fabric, is way nicer than most beach bags. You’ll be able to stow everything you need for a day outdoors, from water to a snack to your favorite beach read. 8. A neutral belt may seem boring, but it’s a much-needed basic all year round. In the summer especially, belting a dress or shorts adds interest to a simple look. Tucking in your tank and cinching your daisy dukes with a belt feels simple, but it really takes a casual look to the next level. If you still need convincing, this H&M belt is just $7. 9. Just like your phone, your everyday watch deserves a fun summer update. This cute watermelon one from ASOS would be awesome just worn as a piece of jewelry, especially as part of a stack of bright bracelets. 10. If you’re like me, you spend 90% of the summer with your hair up. I love the idea of finding something a little cuter than a basic elastic to dress up your ponytail, and this gingham one is so sweet and fun. Plus, it doubles as an adorable bracelet when you do want to let your hair down. What’s your favorite summer accessory? Will you be scooping up any of these? 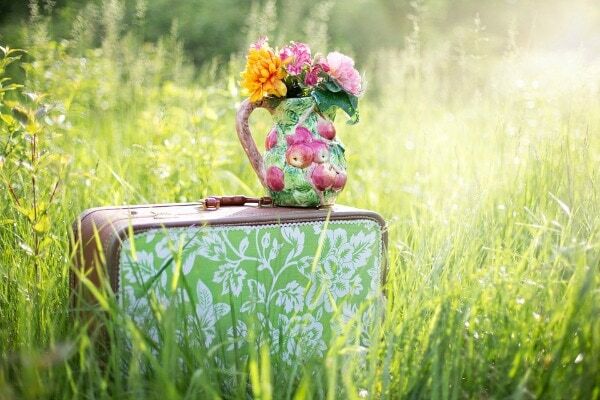 Where are your favorite places to shop for summer items on a budget? Let me know in the comments!